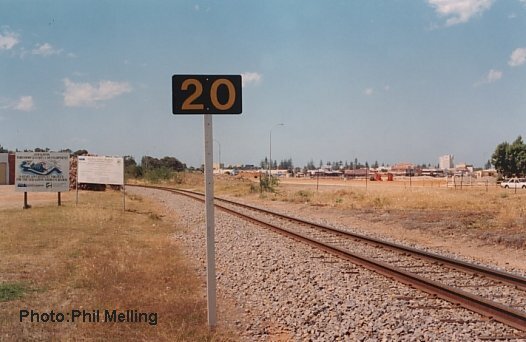 With the relocation of rail operations from the Geraldton foreshore to Narngulu, the Geraldton Railway station is isolated from the main system. 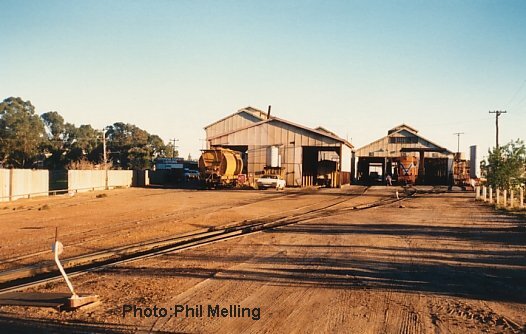 On this page we feature a few photos of the old yard and station surrounds. 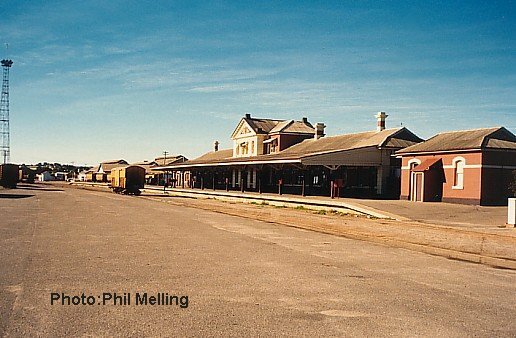 The station has been preserved and restored by a local owner and called "Geraldton Central". The trackside of the Heritage listed Railway Station. The station was served by a dead end track and run round loop. Today, a single track disconnected from the main system exists. The Railway Station is privately owned and stage one of an extensive restoration program has been completed by a locally owned company. Photo taken on 19 June 1989. Part of the Yard looking north, the station is out of view to the right. New breakwaters and reclaimed land has been added to left of the rock wall. Photo Taken 19 June 1989. 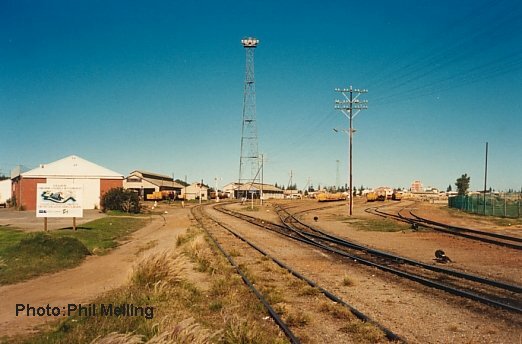 Two photos taken from the same area, the top one taken on 19 June 1989, looking south, from the north end of the yard. The photo below was taken just over 4 years later on 28 November 1993. 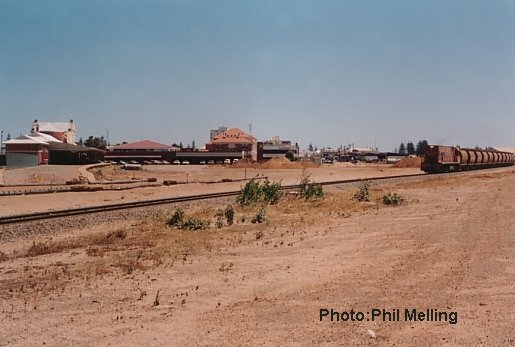 The Loco Depot, looking south, the trees to the left of the depot are still there surrounding the Bill Sewell complex which houses uses such as the Tourist Bureau. 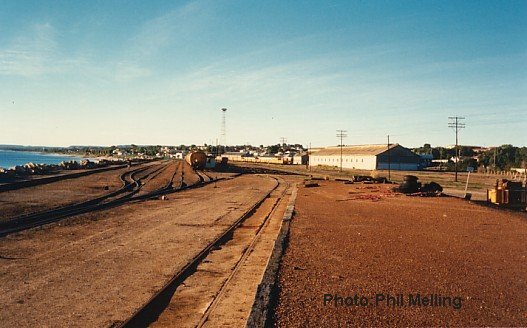 Geraldton Loco Depot and Turntable, looking south, photo taken 19 June 1989. P2003 hauls the sands train through the area once occupied by the marshalling yard. It can be seen in this photo how the remaining line is almost at a right angle to the earlier arrangement. Photo taken on 6 December 1993. 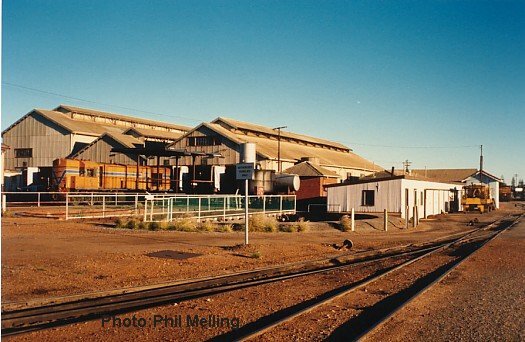 Today the sands train does not work into the Port and terminates at the Mineral Sands plants at Narngulu.